A little primer for gin novices: Though there are numerous types of gin, but the vast majority sold is called London Dry Gin. 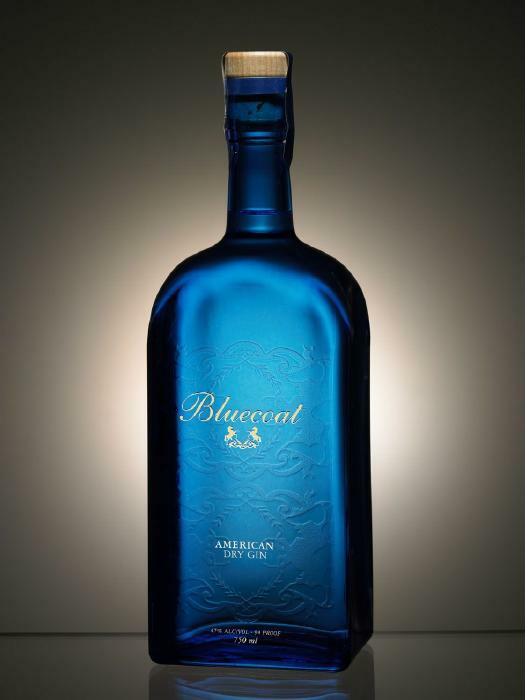 Bluecoat is an American Dry Gin. The difference (putting aside their national origin) between London and American gin (not that there’s a lot of gin made here) is generally one of flavor. The further you get from Londontown, the less juniper you’re likely to find in your gin. Bluecoat, distilled in Philadelphia and packaged in a striking blue bottle, has the immediate aroma of juniper, and won’t disappoint anyone looking for a good-old gin and tonic to start the evening. But gin aficionados will dig Bluecoat’s more interesting flavor profile, one which you don’t get out of traditional gins. It’s immediately apparent when you take the first sip: There’s a strong and surprising mint character, something I’ve never really found in a gin. You also get a moderately strong flavor of lemon, and still that upfront — but not overpowering — juniper taste. Distilled five times in a custom copper pot and bottled at a whopping 94 proof, Bluecoat is quite clean and not nearly as fiery as its alcohol content might indicate. Overall, it’s a very good gin. Bluecoat doesn’t publicly announce all of its ingredients, but the aromatic botanicals, including juniper, orange, lemon, and a secret third citrus peel, are all organic. The base spirit, I’m guessing, isn’t organic (as the gin itself isn’t marketed as such), but it’s clear that Bluecoat has taken a lot of pains to put only the best quality ingredients it can find into that bright blue bottle. I Want My 16 Ounces! This gin is my personal favorite. It is MADE for gin & tonics, especially for those that like a citrus overtone to their G&T. Go out of your way to find it, you won’t be dissapointed. Just had this gin for the first time last night. Makes a very nice martini, and I agree about the mint. This may be my favorite of the new-style light gins on the market today. I’d like to do a side-by-side tasting between bluecoat, bulldog, and g’vine.